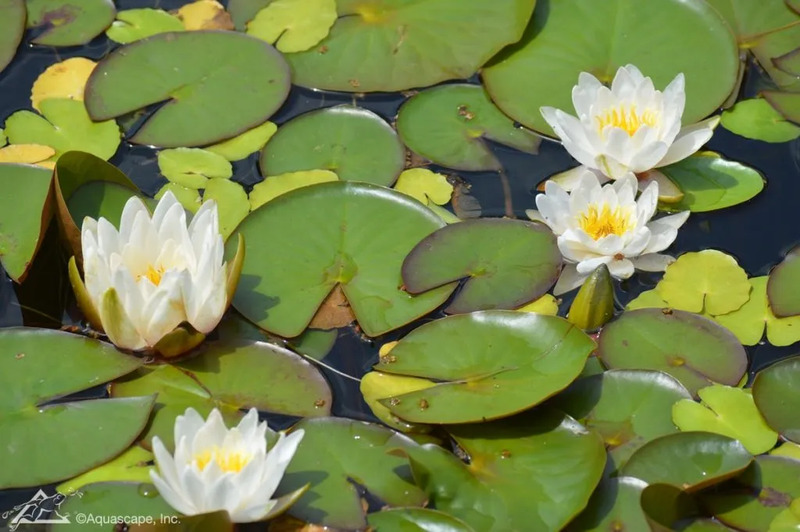 Aquatic plants play a significant role in achieving a healthy and balanced ecosystem pond. 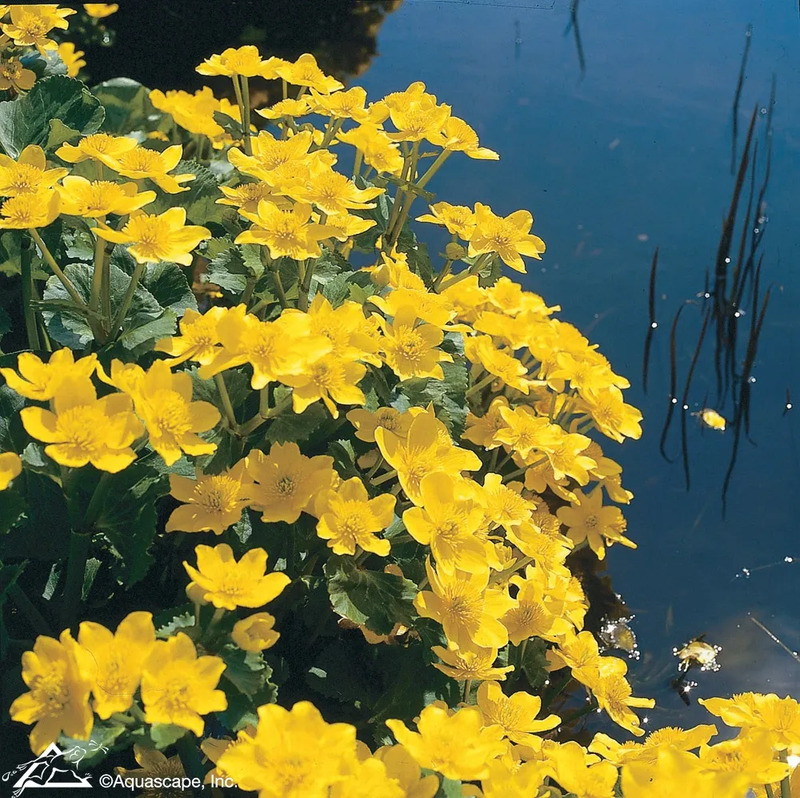 Even though most people start a water gardening hobby to enjoy the sound of running water, implementing an array of aquatic plants is still an important aspect of being a pond owner. They add natural appeal and beauty with a variety of plant offerings. 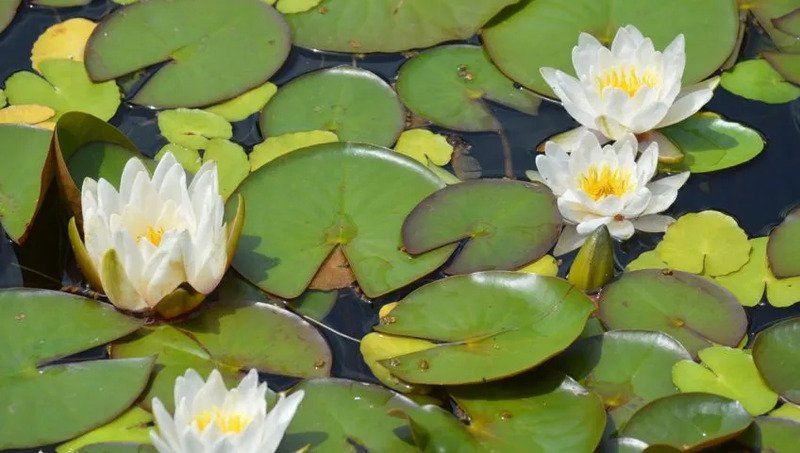 The most important function of aquatic plants is their ability to act as a natural filter by providing essential biological filtration to eliminate nitrogen, ammonia, nitrates and other harmful compounds from pond water. Without these plants, the water clarity of your ecosystem will be compromised by excess nutrients. In the end, adding plants to your water garden reduces maintenance so you can spend more time relaxing with your water feature. The main classifications of aquatic plants include water lilies, marginal plants, floaters and submerged (also known as oxygenators). These plants are also split up into two basic categories known as “tropical” and “hardy.” Hardy plants can thrive during harsh winter months, while tropical plants fare better in warmer climates, even though they are commonly used as annuals in the Midwest. Water lilies often act as the centerpiece for water gardens, making them one of the most popular aquatic plants around. Every water garden should incorporate at least a few beautiful water lilies. Aside from their eye-catching qualities, water lilies also offer protection and shade to keep the pond nice and cool for koi fish. 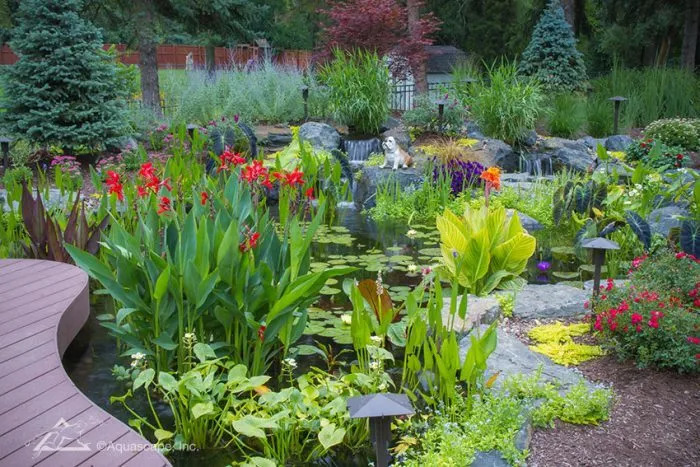 Ideally, thirty to sixty percent of your pond’s surface should be covered with aquatic plants and water lilies are an aesthetic way to accomplish this. 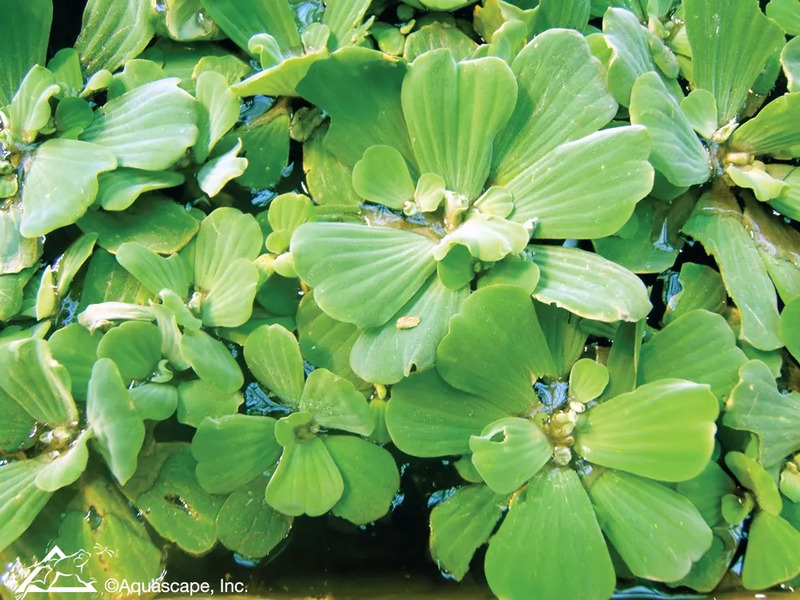 Marginal plants are the largest aquatic plant group and include both hardy and tropical varieties. Like a Daylily or Black-Eyed Susan, most marginals are perennials, meaning they’re durable and return every year. Marginal aquatics provide valuable filtration and beauty for your water garden. Their name stems from the fact that they grow around the edges or “margins” of a pond or lake. Other examples of marginals include creeping jenny, marsh marigold, sweet flag, taro, canna and water iris. They flourish in damp soil or standing water covering the base of the plant from two to six inches. Floating plants, as you might’ve guessed, float on the water’s surface! The dangling roots underneath the plant soak up excess nutrients in the water. Floaters excel as natural filters in your pond because they remove nutrients straight from the water instead of the soil like other aquatic plants. Floating plants like water lettuce and water hyacinth are great choices for covering the surface of your pond. As the name indicates, submerged plants are situated below the water surface, although they do occasionally bloom causing flowers to rise above the surface. Commonly known as oxygenators, these plants spend most of their day creating oxygen. This group of plants includes: anacharis, foxtail, vallisneria, elodea, cabomba and hornwort. Like floaters, submerged plants take nutrients directly from the water. This helps balance the ecosystem because they starve algae from its source of nutrients. 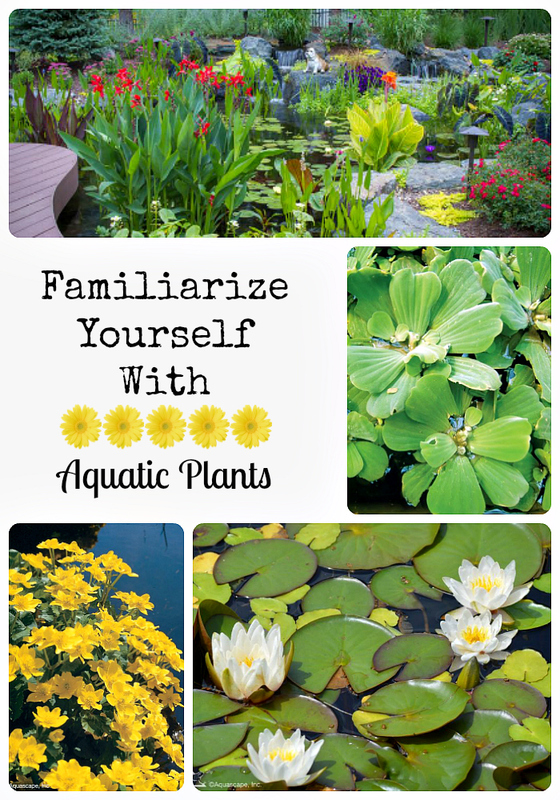 A proper combination of aquatic plants brings the best visual impact for your water garden. Using marginals helps your pond coalesce into the landscape surrounding it, while water lilies draw attention to the water’s surface. It’s important to understand all the wonderful choices available so you can find what appeals most to you.